FSP this week announced its new series of redundant PSUs called the 'Twins'. The new power supplies are compatible with standard ATX and PS2 tower chassis, but provide redundancy capabilities and can thus enable building non-stop servers using 'relatively affordable' components. 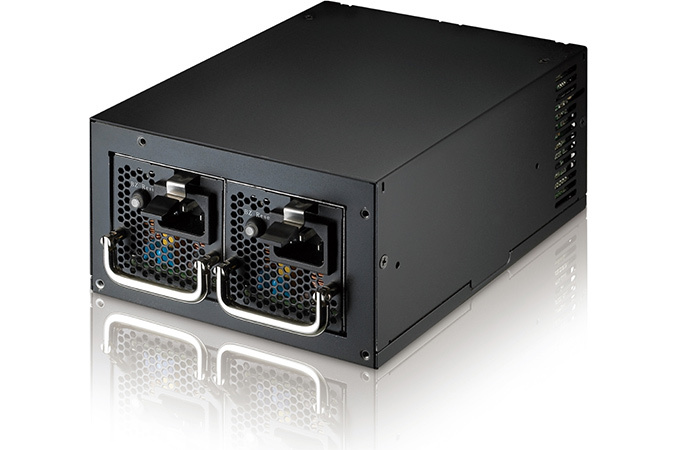 The manufacturer positions the FSP Twins PSUs for home and SMB mail, web and intranet servers when building in a standard ATX or PS2 tower chassis. Like other redundant power supply units, the FSP Twins houses two hot-swappable PSUs and if one fails, another immediately kicks in, ensuring that the system never stops due to power supply failure. Both PSUs can be replaced without shutting down the machine, similar to typical datacenter-class mission critical servers. The PSU modules are proprietary, and each has its own 40-mm high-pressure server-grade fan, implying they have the potential to be pretty noisy. The FSP Twins series come with special firmware and sensors that monitor over-current, short-circuit, over-voltage, or fan failure, and the special LED indicators can alarm users of any problems. Initially, FSP will offer two Twins models with 500W and 700W PSUs. The Twins will have EPS12V power connectors (one 24-pin and two 4+4-pin connectors) and will thus be able to handle dual-socket (or even multi-socket) motherboards up to the power capacity. The 500W version will feature two PCIe 6+2-pin power connectors, six SATA power connectors, two Molex plugs, one connector for floppy drives and one 8-pin USB connector to interface with monitoring software. FSP notes that all cables supplied with the Twins are flat in a bid to enable easier cable management in space-constrained chassis. The specifications of the 700W unit have not been announced as of yet. The FSP’s Twins series is not the first attempt to wed ATX/EPS12V PSU form-factor with redundancy. However, some of the predecessors of Twins did not have enough wattage for modern servers, poor serviceability, or became EOL quite quickly for replacement components. Moreover, keep in mind that an ATX chassis is not particularly designed for a server, despite the homebrew market, which is why the market for such PSUs is relatively small. The FSP Twins 500W will cost $399, which comes across as a reasonable price for a redundant PSU module that is essentially two 500W units. The price of a 700W version is being determined, as is the individual units themselves. Both will come with a five-year limited warranty later this year. FSP will demonstrate its Twins series at the Computex Taipei 2016 trade show next week.